Even though the first day of Fall is not until September 22nd, for some reason August 31st always feels like the end of Summer to me. Right when September 1st rolls around, I feel like Summer has officially ended & Fall has begun. 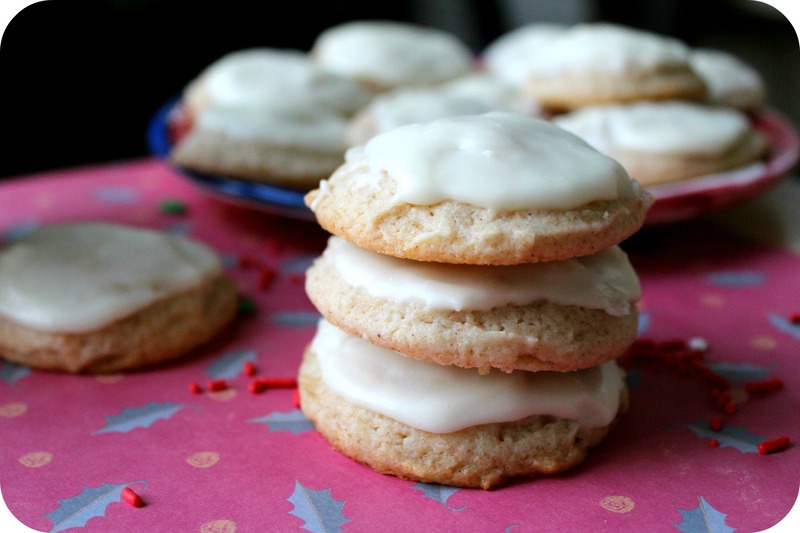 As you may know from my last few baking posts, I am more than ready for Fall. So I thought I’d make one last ‘Summer’ recipe before the blog is all things pumpkin! 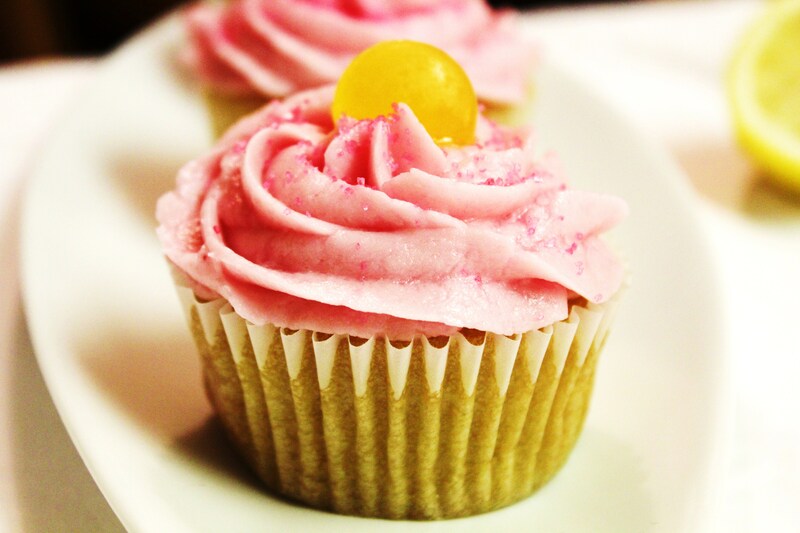 I made PINK Lemonade Cupcakes, and they are every bit as tasty as they are gorgeous. I love how bright and colourful they are, (It’s a nice change from cranberries & nutmeg) and they are super moist & light. 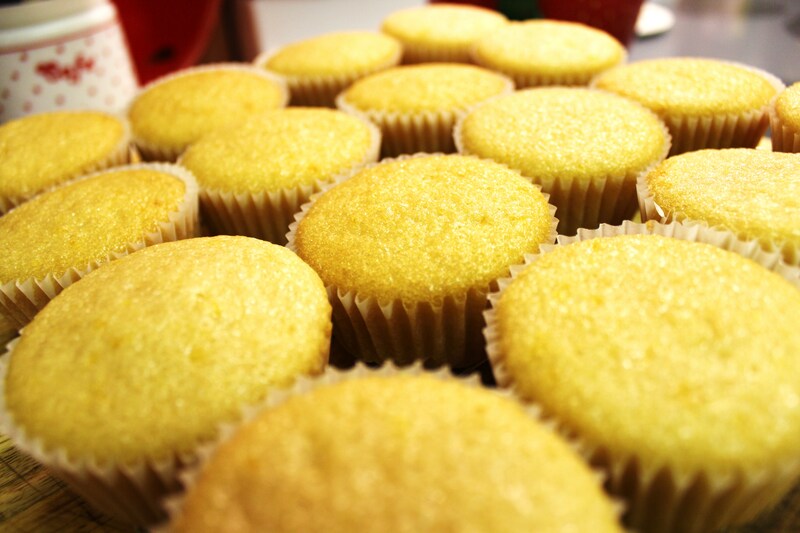 Unlike most cupcakes, the cake is fluffy, fresh, & lemony – not heavy at all, (No eggs are used). These cupcakes are definitely a summer-must at a backyard BBQ! In a medium bowl, mix together all of the dry ingredients – Flour, Sugar, Baking Soda, Salt, & the Lemon Zest. Set Aside. 2. 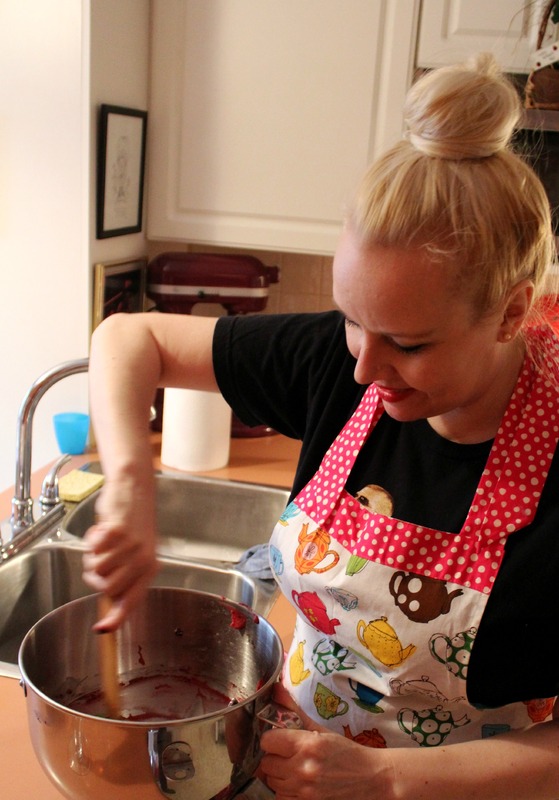 In a large bowl, mix the wet ingredients – Water, Oil, Vanilla Extract, Vinegar & Lemon Juice. Combine the dry ingredients into the wet ingredients & stir slowly until ingredients are evenly combined & no lumps appear in the batter. Do not overmix. 3. Pour the batter (The batter will be extremely wet!) into lined baking pans, about 2/3 of the way full. Bake for 20 minutes, or until a toothpick inserted in the centre of a cupcake comes out clean. 1. 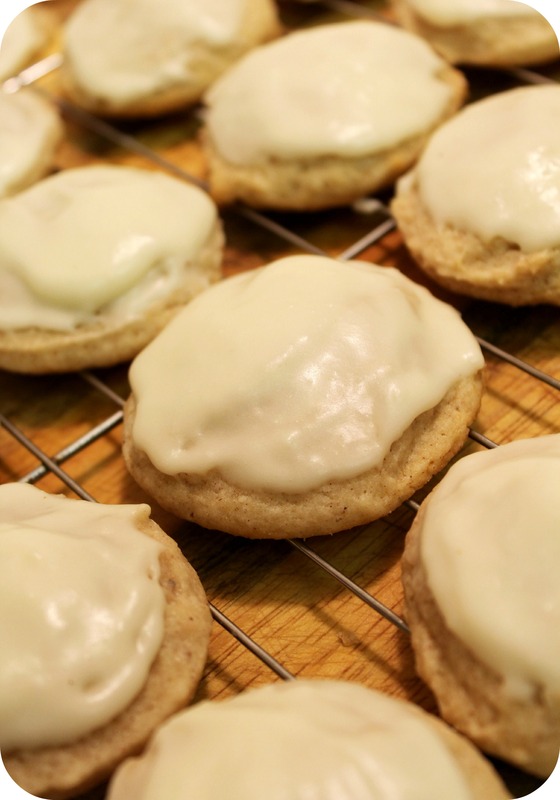 Using your electric stand mixer, beat the butter on medium speed until light and fluffy. Add in the icing sugar slowly, (scrape down the sides of the bowl with a spatula as needed) to your preference of sweetness. 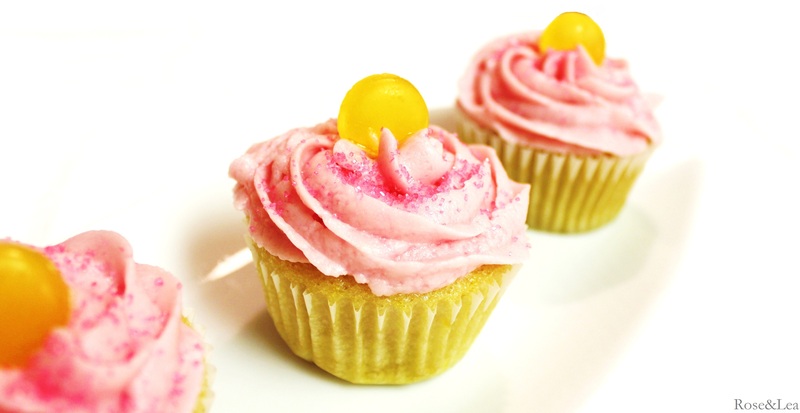 Add the lemon juice & a few drops of red food colouring – mix until you get the perfect fluffy frosting! It tastes like a creamy, whipped, chocolaty dream. Heavenly. Andddd it’s in a martini glass which automatically makes any kind of drink even better. I like to think of this drink as a ‘rainy day cure’. 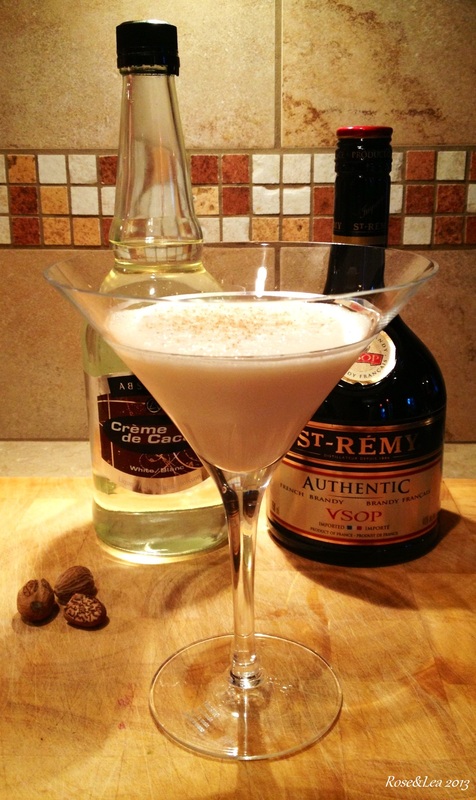 The smell of the fresh nutmeg and the sweet and savory flavours make it the perfect drink for Fall and Winter months. 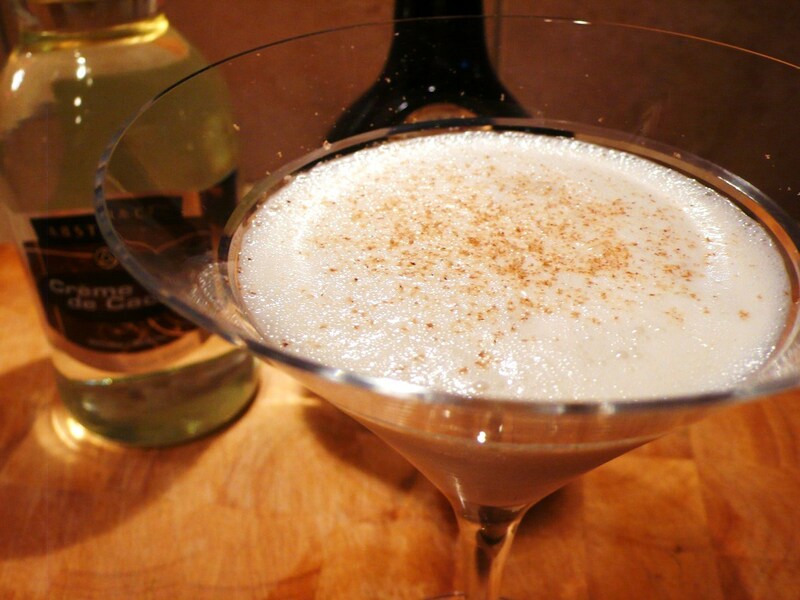 Cozy up by the fireplace, take out some board games & have a Brandy Alexander with your friends & loved ones! Add some crushed ice to a martini shaker. 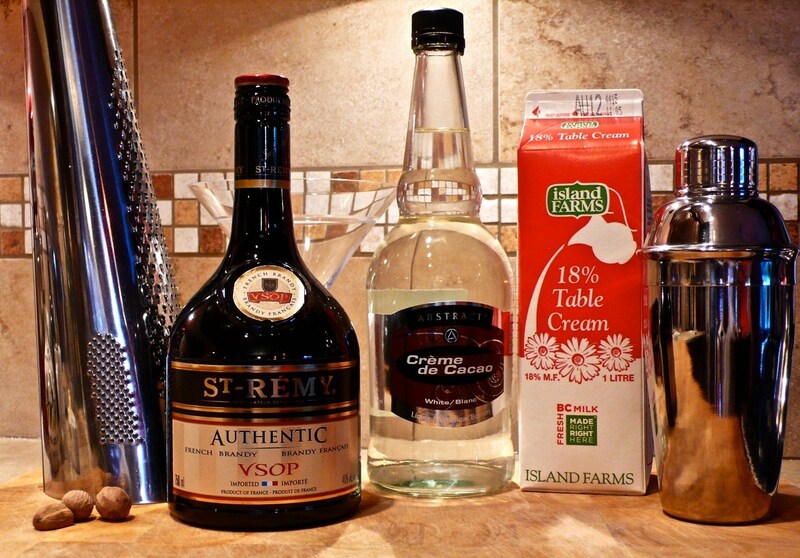 Add Brandy, Creme de Cacao and Cream. 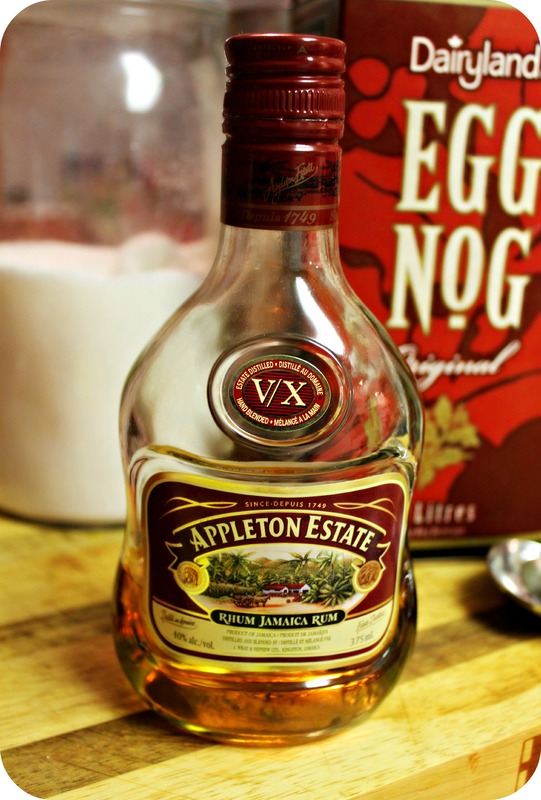 Shake for 30 seconds, and pour into your preferred glass. Grate some fresh Nutmeg to taste. – Canadian singer-songwriter Feist named a song after the drink on her album The Reminder. – Despite its wide popularity, its origin is unknown. – The earliest version was made with gin. I’ve been on a total baking kick lately, and I’m loving it. I’m definitely a beginner baker but I’m excited to learn more as I go along. I’ve been obsessed with all things baking and have been researching everything from different types of sugars to ingredient substitutions. I’ve seen many different variations of gorgeous Confetti Cakes on various blogs & sites and I knew I had to make my own asap. 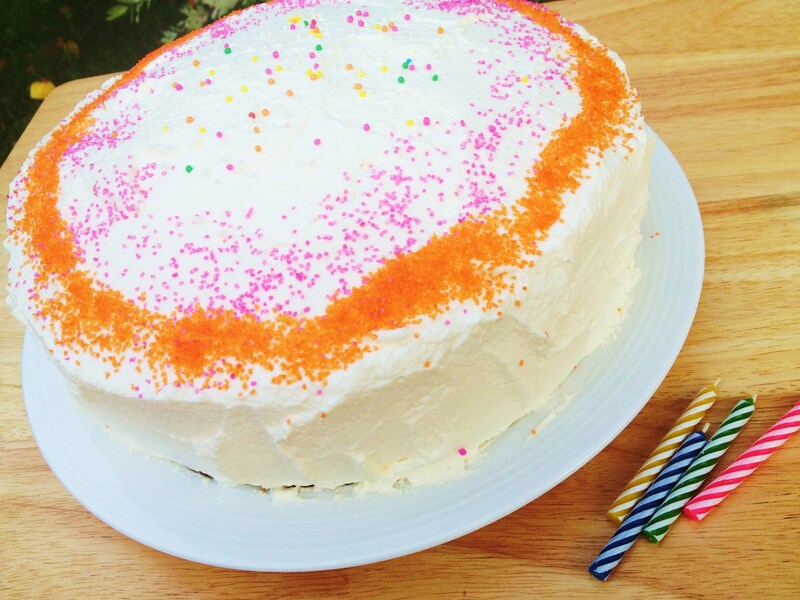 My grandpa’s birthday party was yesterday and I decided to make him a confetti cake! 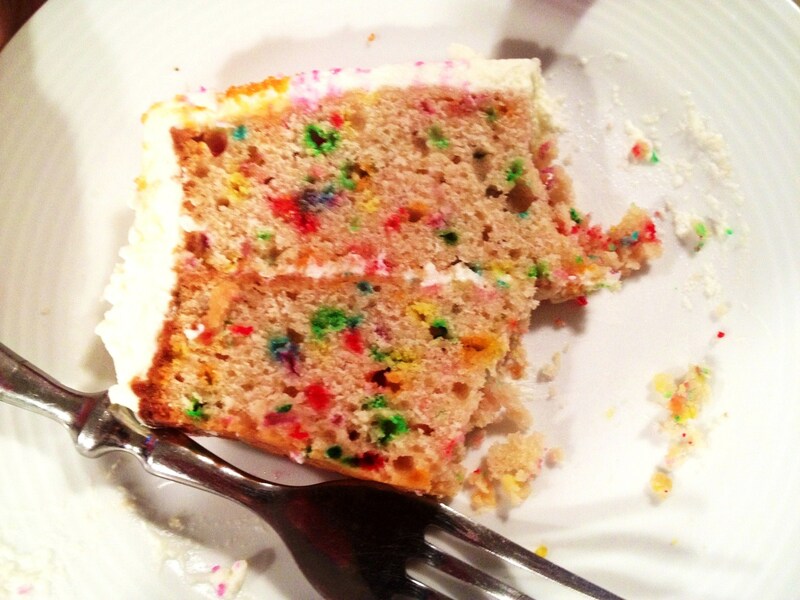 I’ve never attempted to bake a homemade confetti cake before, only Duncan Hines box brands (which are actually really good! ), so I was pretty excited. 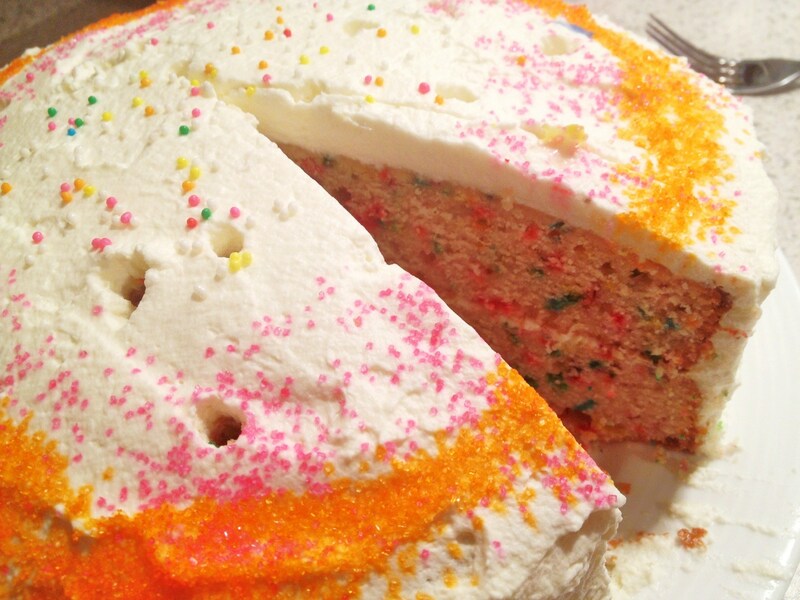 I searched through a lot of different recipes and read a lot of reviews and with the help of my mom, I put together my own version of the eye-catching confetti cake. Not without some trials and tribulations though! 1. 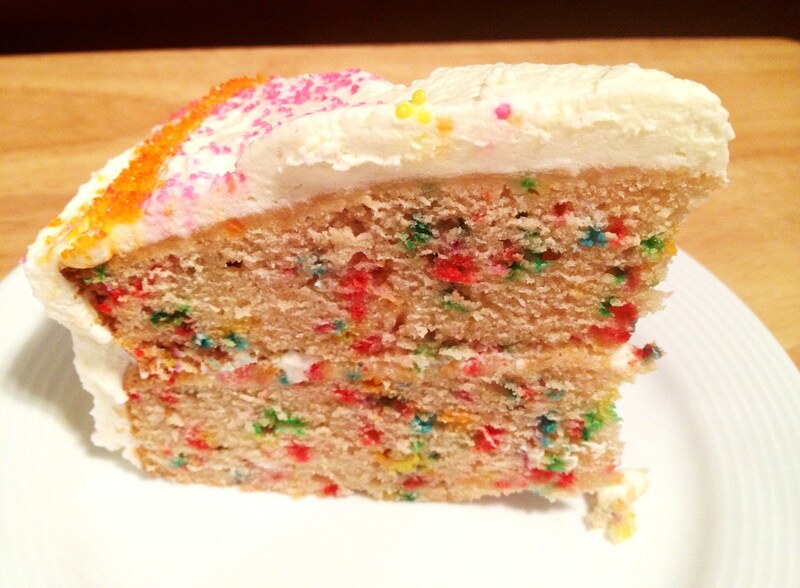 Firstly – I didn’t have enough sprinkles! I don’t know what I was thinking but it was too late to run to a store so I ended up just using some red, white and green Christmas jimmy sprinkles which worked out fine! I didn’t use a lot as to not overpower the other colours but I think the red and green actually made the cake look a tad ‘manlier‘ which is good since it was for my grandpa. 2. 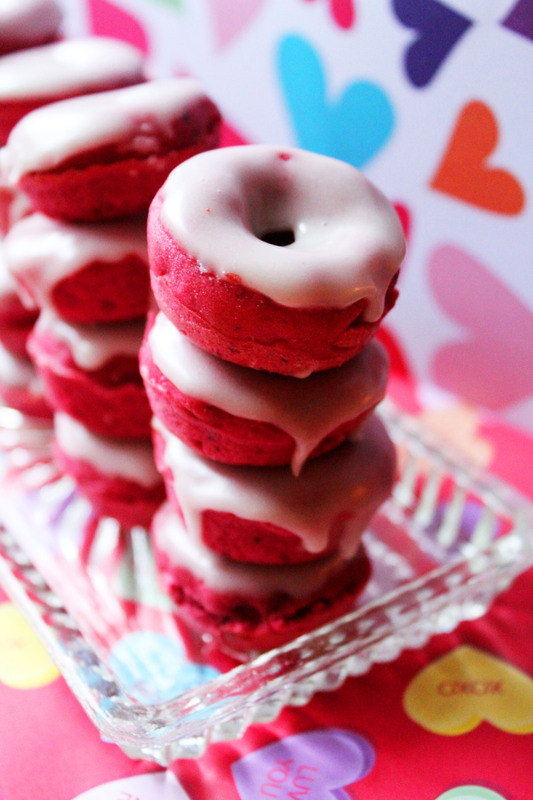 The icing was a major problem. 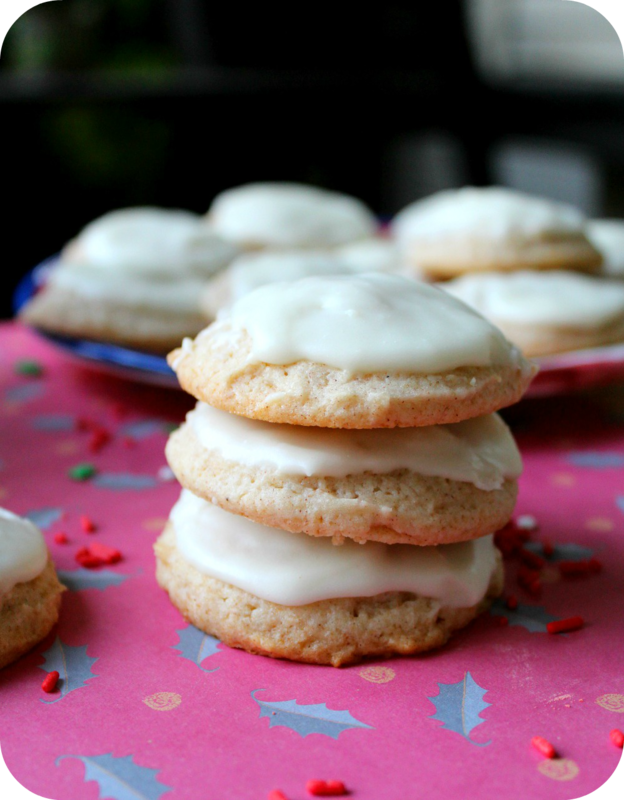 At first I decided to use a typical vanilla buttercream frosting, so I whipped it up and I was shocked. It was the sweetest tasting buttercream I’ve ever tasted. Like sickingly sweet. Almost like bad grocery-store-bakery sweet. It was also extremely thick.. (I will post the recipe below) so I decided to wing-it last minute and make my own whipped cream frosting instead. I’ve made simple vanilla whipped cream frostings before (strawberry pies) and I’ve always found that whipped cream tastes way better than any kind of buttercream or cream cheese icings. I can’t stand overly sweet, fake tasting icings. Since I had SO much of the buttercream icing leftover from the first batch, (and I hate wasting things) I decided to use a small, small amount of the buttercream for the icing in between the two layers. 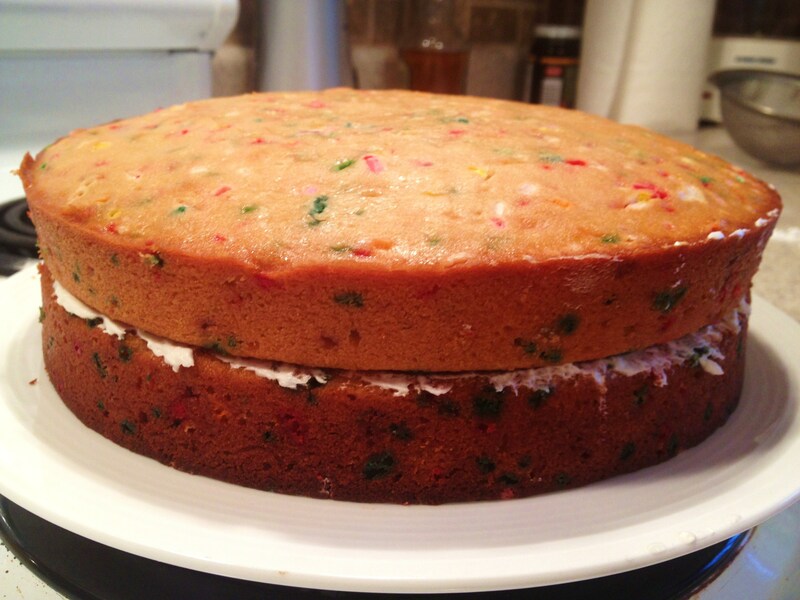 It tasted fine in between the layers but next time I make this cake I won’t be making the buttercream at all. 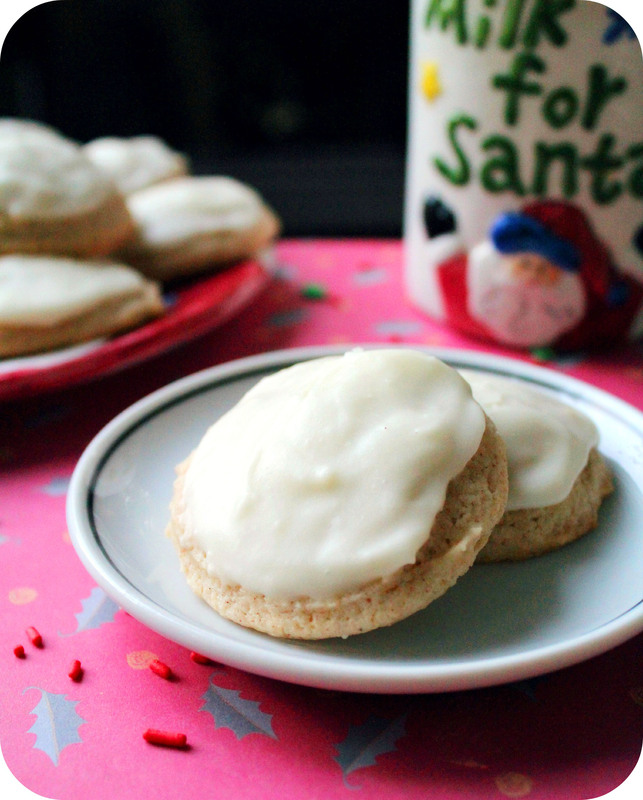 Just the vanilla whipped cream! My grandparents both loved it and my brother (who is not a big sweets person at all..) even had seconds! 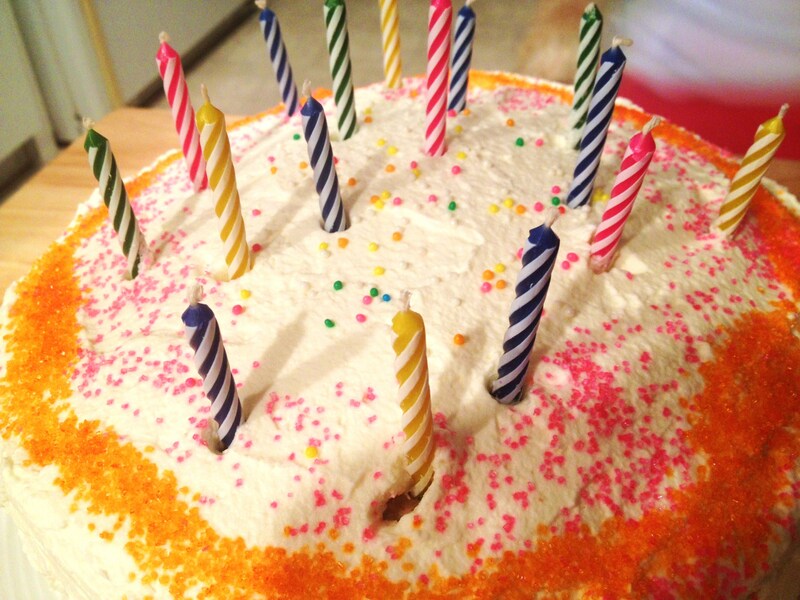 My grandma has already requested that I make this cake again for her birthday (which is not until December). 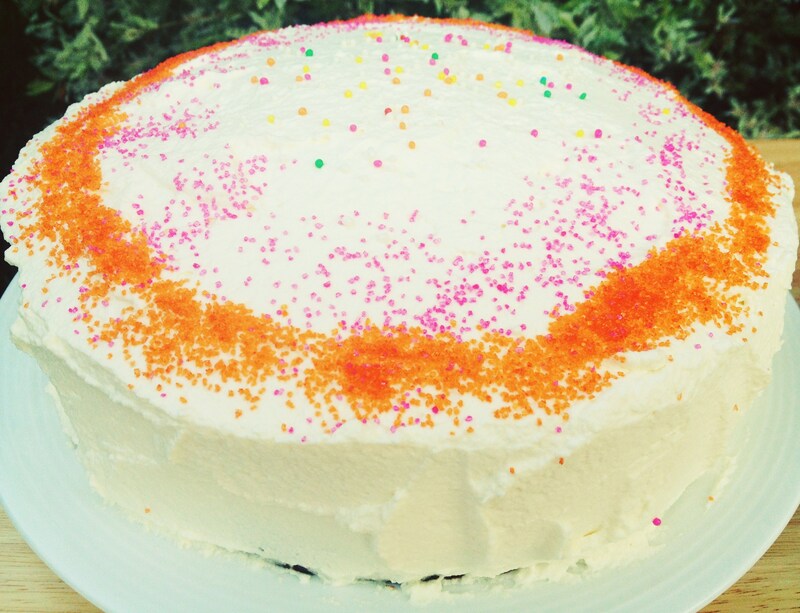 The whipped cream was the perfect light icing, the sprinkles didn’t run at all, and the cake looked so fun and party-ish! Perfect for a summertime birthday! 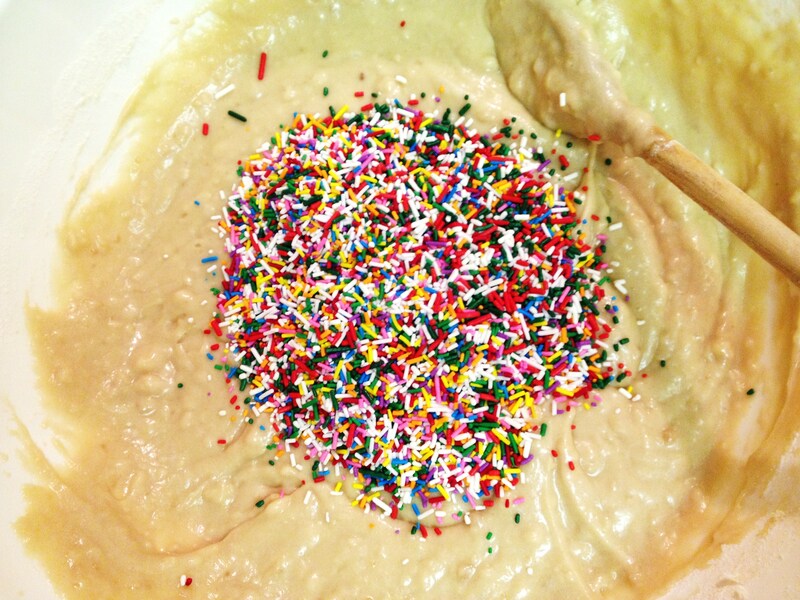 1 1/3 cup sprinkles – Jimmies work best. 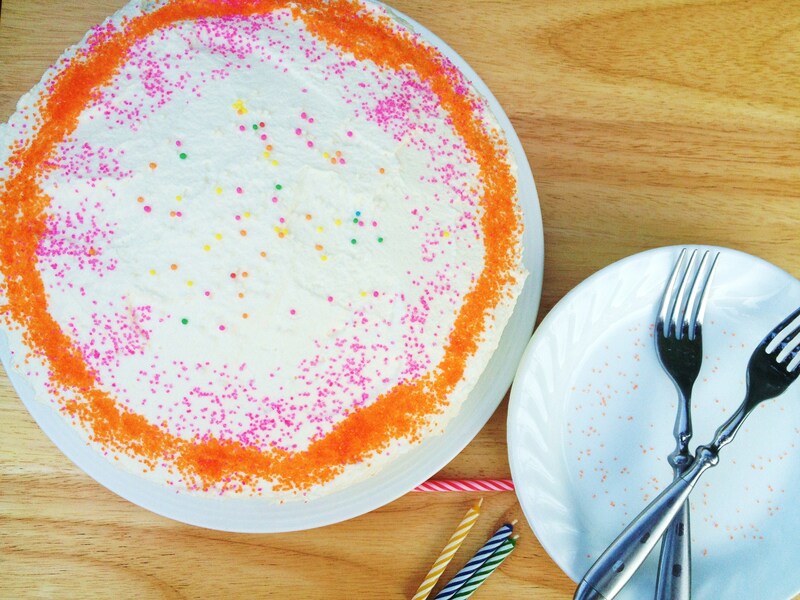 Don’t use nonpareils (the round sprinkles), as the colours tend to run/spread. 1. Preheat oven to 350F. 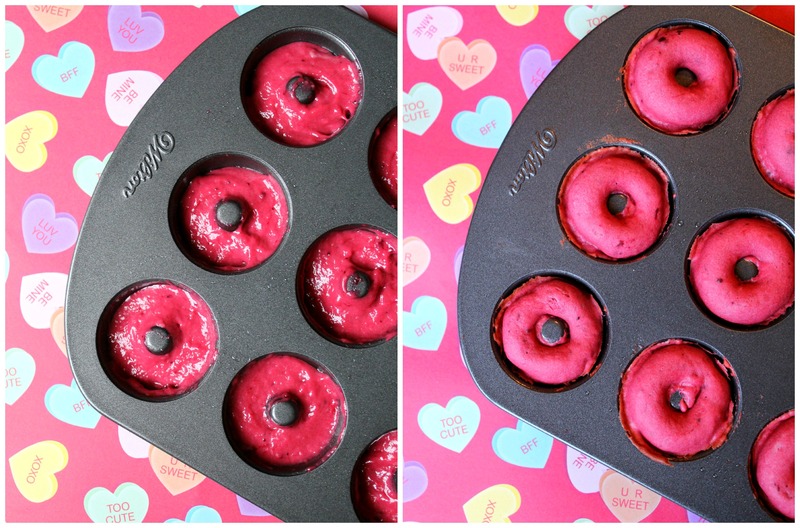 Grease or spray two 9-inch round baking pans and set them aside. 2. In a medium bowl whisk together flour, baking powder and salt. Set aside. In a small microwave-safe bowl, melt butter in the microwave for about a minute or until butter is melted. Transfer the butter to a larger bowl, and whisk in the sugars with the butter. Mix well, making sure all the brown sugar lumps are gone. You’ll know it’s ready when the mixture becomes thick and harder to stir. Whisk in eggs, yogurt, milk and vanilla extract until combined. Slowly mix in the dry ingredients until no lumps remain. 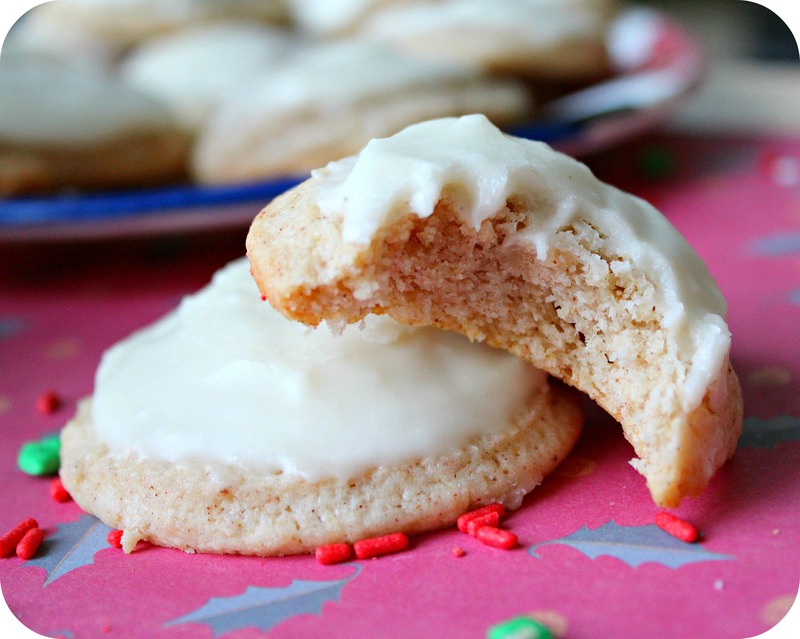 Slowly fold in sprinkles. 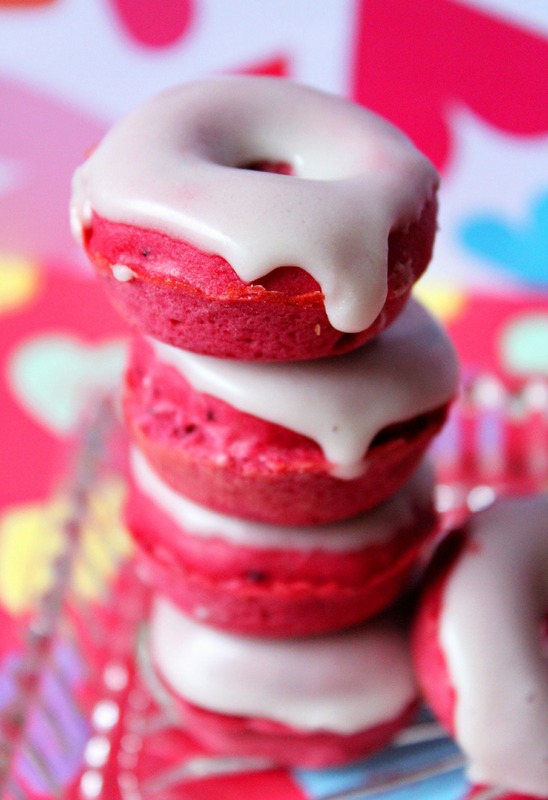 Be careful not to overmix so the sprinkles don’t bleed their colour! 3. 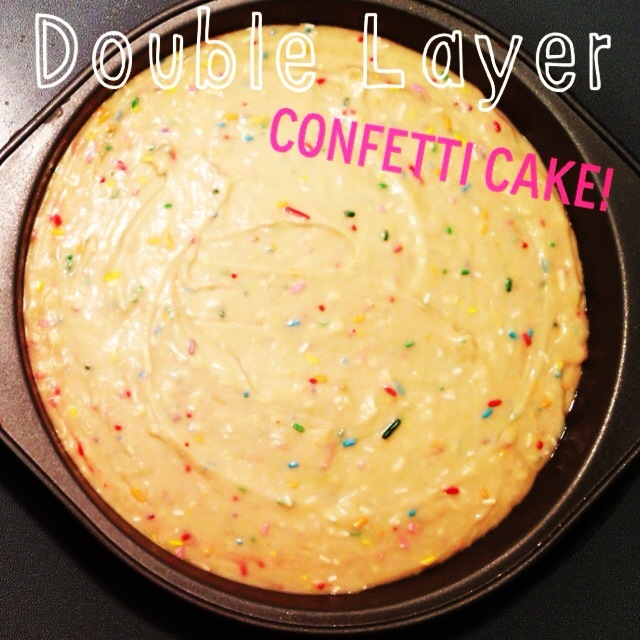 Pour batter into prepared cake pans. Bake for 35-38 minutes. Oven temperatures vary so start checking around 25 minutes! Cakes are ready when toothpick inserted in the center comes out clean. Allow to cool. 4. In a medium bowl, whisk heavy cream with electric mixer on high speed for 3-5 minutes or until fluffy. Add icing sugar and vanilla and mix until combined.